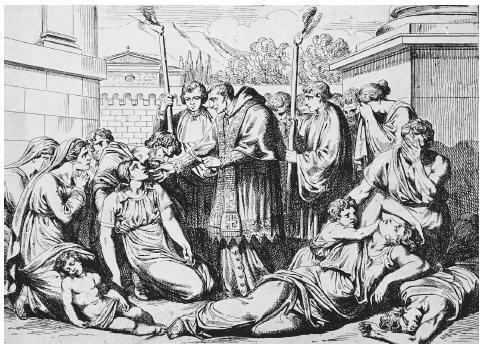 In this drawing, Saint Borromeo assists plague victims. In its most lethal periods, the ancient epidemic—whatever its cause—killed as many as four out of ten people in the areas affected. work on. Daily experience was saturated with dying, death, and grief. Religious belief and practice had given priority to helping the dying person leave this world in a state of grace and to providing a proper funeral with meaningful and comforting rituals. This tradition was overstressed by the reality of catastrophic death: too many people dying too quickly with too few available to comfort or even to bury them properly. Furthermore, the infectious nature of the disease and the often appalling condition of the corpses made it even more difficult to provide the services that even basic human decency required. The black death was a horrible disease and it spread quickly and easilly. The symtoms for the black death were horrible and doctors didn't have any idea how to cure them.This disease could have been caught through breathing in the air and coughing and sneezing. Many people thought that the disease came of rats and the germs lived in the guts of there fleas. The fleas would then bite us giving people germs that would then cause the black death, when people caught the black death at the most they normaly had up to a week to live. I would like to get more information on the black death. The thing is, we know that the Black Death started from the east and the started spreading through the west ending up in Europe but in miles or kilometres, how fast was the Black Death approaching and what was the real reason for people fearing the black Death? I know that there was pain and death and that there were horrific consequences for the Black Death but was there something else that scared peopple about the Black Death?My other question was if you know why the black Death was called the Great Mortality and the black Death? i think there should be more things on the internet about the plague, i'm doing a write-up about it and i wanna know more. This has given me a full insight on the black death. Seeing that i'm studing it in grade 9 sose. There is probalby any of finding this much information i books today. I found everything that i needed to forfilled the task that was set for us pupils in school. There is description and detail in the writing which makes it easy for you to find the information on the diease. Thank you very much for displaying enough information for me to continue. The amount of people that died was about 200,000 people in the medieval europe. What was the Black Death's impact on the church, the kings, and the status of women? this does not give information on my original question which was asked. How is the blackdeath spread? you should consider linking the different sights to the correct questions and all those possible to be asked. The Black Death was spread by the flea to infected rats, and then to humans. The fleas would then, engorged with the Yersinia pestis bacteria, would hungrily search for a new host after the death of an infected rat. The Yersinia pestis would actually clot inside the flea, keeping it from digesting the blood and quenching the thirst. In order to remove said blockage, the flea would have to allow it's "pumping" mechanism to release when feeding, thus releasing the Y. pestis into the new victim. uhh i'm writing a report for my school and I found this website very helpful. I have been doind research and writing a paper on the Black Death, but I can't seem to get the same answer for how many people it killed in Europe during the medievel ages. Some have said 3 million, others 24 million. I na previous comment someone left on here, they said 200,000. It would be different if there was not such a gap between the numbers. This article really helped me w/ my historical project on the Black Death. this was really helpful for me, i had to write a 5 page paper on AIDS vs. the Black Death, and this website was the best one i've found so far!!! What was the actual cause of death to those who got the Bubonic Plague? What were some conditions, other then horribly unsanitary conditions and high rat populations, that helped spread the disease?